62 MMS November 2017 mmsonline.com QUALITY GAGING TIPS Columnist A bench comparator stand is not a very com- plicated device. If you go to choose one, however, you'll find there are hundreds of options, sizes and levels of quality. In selecting the right stand, it's important to understand your application thoroughly to make sure you get enough capability for your needs. With a little upfront work and by asking the right questions, you will end up with faster, easier, more accurate measurements, and spend less time on repairs and adjustments. It may take just a little more planning, but you'll come out ahead. A bench stand consists of an indicating device plus a post/arm assembly mounted to a base that incorporates a locating surface for the part. In contrast, a post/arm assembly with an indicator and no locating surface for the part is known as a test stand, and it must be used with a surface plate. And this is not to be confused with a bench thickness gage that has the locating surface for the part and an indicating device but does not have the flexibility of the arm/post arrangement. 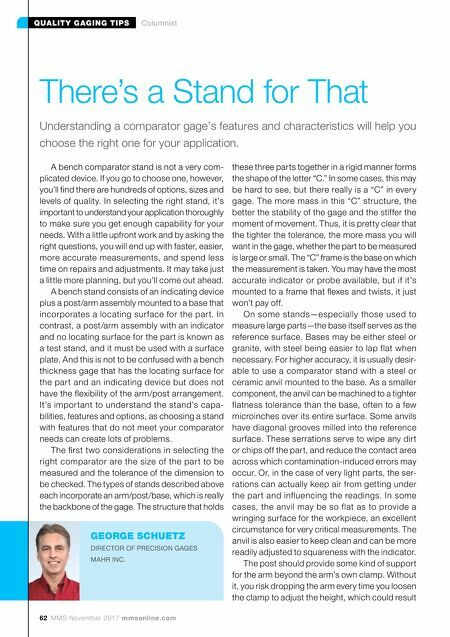 It's important to understand the stand's capa- bilities, features and options, as choosing a stand with features that do not meet your comparator needs can create lots of problems. The first two considerations in selecting the right comparator are the size of the part to be measured and the tolerance of the dimension to be checked. The types of stands described above each incorporate an arm/post/base, which is really the backbone of the gage. The structure that holds these three parts together in a rigid manner forms the shape of the letter "C." In some cases, this may be hard to see, but there really is a "C" in every gage. The more mass in this "C" structure, the better the stability of the gage and the stiffer the moment of movement. Thus, it is pretty clear that the tighter the tolerance, the more mass you will want in the gage, whether the part to be measured is large or small. The "C" frame is the base on which the measurement is taken. You may have the most accurate indicator or probe available, but if it's mounted to a frame that flexes and twists, it just won't pay off. On some stands—especially those used to measure large parts—the base itself serves as the reference surface. Bases may be either steel or granite, with steel being easier to lap flat when necessary. For higher accuracy, it is usually desir- able to use a comparator stand with a steel or ceramic anvil mounted to the base. As a smaller component, the anvil can be machined to a tighter flatness tolerance than the base, often to a few microinches over its entire surface. Some anvils have diagonal grooves milled into the reference surface. These serrations serve to wipe any dirt or chips off the part, and reduce the contact area across which contamination-induced errors may occur. Or, in the case of very light parts, the ser- rations can actually keep air from getting under the part and influencing the readings. In some cases, the anvil may be so flat as to provide a wringing surface for the workpiece, an excellent circumstance for very critical measurements. The anvil is also easier to keep clean and can be more readily adjusted to squareness with the indicator. The post should provide some kind of support for the arm beyond the arm's own clamp. Without it, you risk dropping the arm every time you loosen the clamp to adjust the height, which could result There's a Stand for That Understanding a comparator gage's features and characteristics will help you choose the right one for your application. 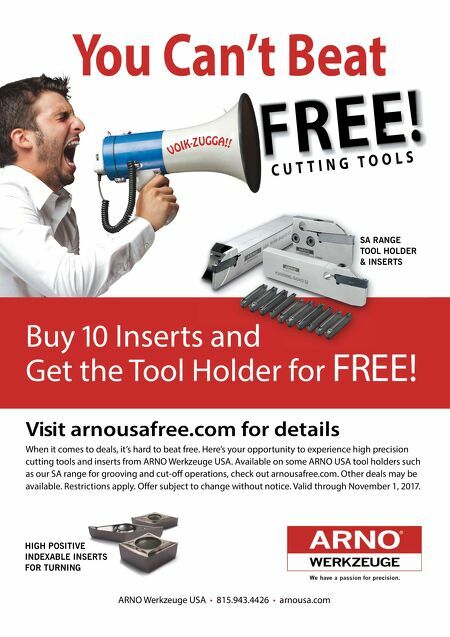 GEORGE SCHUETZ DIRECTOR OF PRECISION GAGES MAHR INC.